This two tone engagement ring serpentines around the finger like a pair of entwined metallic snakes. The bypass design of this engagement ring creates visual intrigue with a split shank. 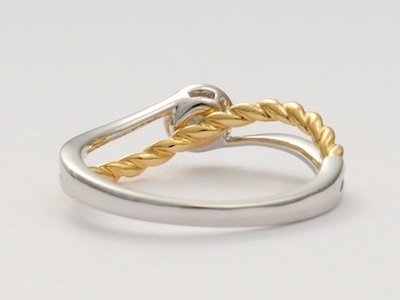 A yellow gold swirl winds its way between the white gold for a mesmerizing two-tone effect. The focal point of this vintage style engagement ring is a bezel set round diamond. Details: New. Vintage Inspired. 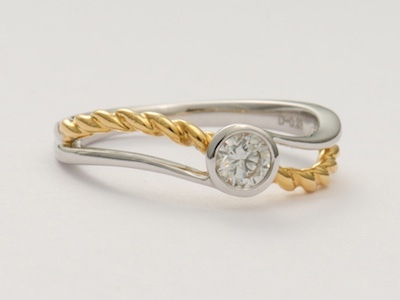 18k white gold and 18k yellow gold. Round brilliant cut diamond; 0.23 carats. Special characteristics This vintage style engagement ring in 18k white gold features a round brilliant cut diamond that is bezel set. 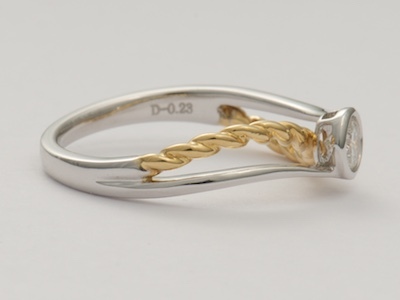 The two tone split shank bypass design mounting has a twist design trim in 18k yellow gold. Other notes This ring pairs beautifully with wedding band style RG3705 or RG3706. The bands may be purchased separately. The engagement ring is shown with each band in the photos. Options This ring is also available in 18k white gold.